Retiring now is very different then when your parents retired. Inflation, increasing taxes, market volatility, funding health care expenses — these are all challenges you will face in retirement. We’ll make sure you don’t face them alone. Diversification is one of the keys to a stable investment portfolio. Because we are independent of wire-house rules, we have the freedom to select the most appropriate investment vehicles for our clients. Employees nearing retirement may be faced with difficult decisions when presented with their retirement plan payout options. We can guide you through your options and help you potentially maximize your benefits. Electing the best Social Security option isn’t as cut and dry as it seems. Social Security themselves can’t even tell you what’s best. We’ll run calculations to ensure you pick the best possible option for your unique situation. Tax preparation is simply recording history, but tax planning is looking into the future and strategizing so that your tax burden is as minimal as possible. Our seasoned staff of CPA’s and Enrolled Agents are here to help. Choosing the most appropriate Medicare coverage can not only be confusing but downright frustrating. We’ll help you navigate the various options you have, and help you pick the best plan for your situation. A solid financial plan is not complete without adequate insurance protection. There’s much more to homeowners, auto and umbrella insurance than just saving 15%. Having the right coverage is serious business. 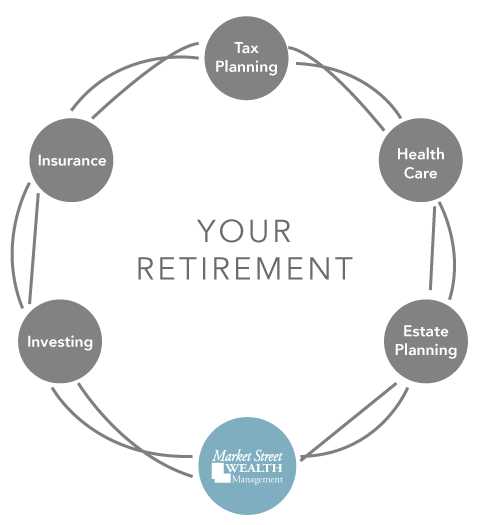 Why Market Street Wealth Management? There is so much more to retirement planning than re-balancing your portfolio every once in a while. Many financial advisers fail to realize that, and if you don’t know what you don’t know, neither will you. Our entire business model is built specifically around the unique needs of clients who are approaching retirement, or already retired but seeking a more full service experience, where multiple services are offered under one roof, and they are treated like a valued client, not a number on a spreadsheet.